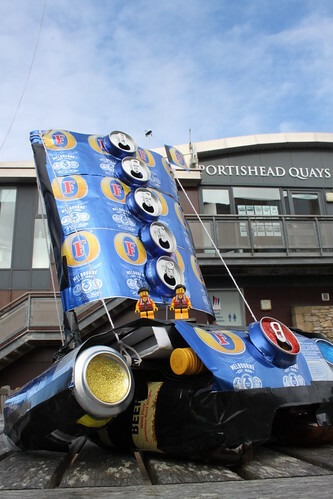 The little guys were delighted this weekend just gone to be invited to Portishead’s Great Green Recyclable Regatta. 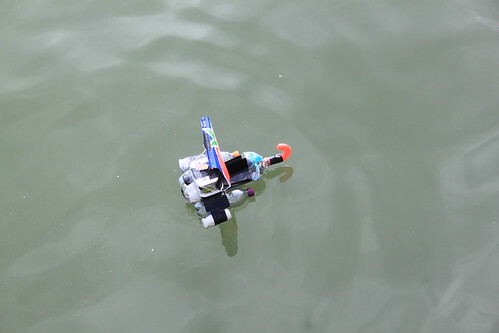 Organised by the lovely people at Compass Sea School in aid of the RNLI, the event encouraged competitors to construct small wind-powered craft out of the contents of their recycling bins. 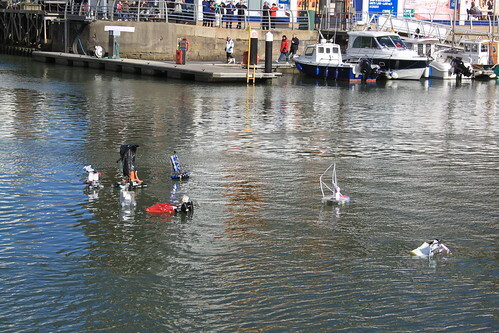 These would then be raced along a straight course at Portishead Quays Marina. 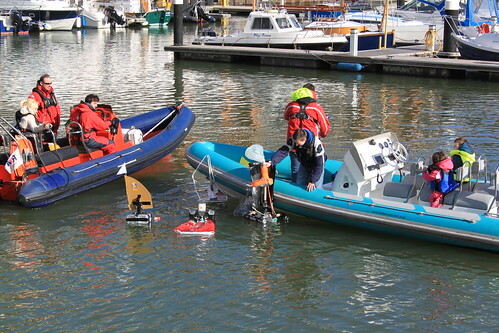 The Crew are keen sailors themselves, so they were excited to have the opportunity to get involved. And I recently studied for my VHF certificate at Compass Sea School – and have just started volunteering as a fundraiser for the lifeboat station at Portishead (which is about to be adopted by the RNLI) – so I wasn’t entirely unexcited, either. Even Natalie and Molly tagged along. Once registration was complete, the boats were transported to the start line. And when they were carefully lined up, the hooter was sounded and everyone got quickly out of the way to let the wind do its work. A small group of boats built up an early lead, with the smaller ones doing well at first. 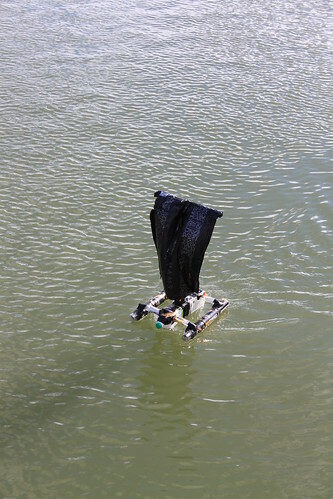 Gradually, though, the larger craft got into the groove and started to work their way through the fleet. 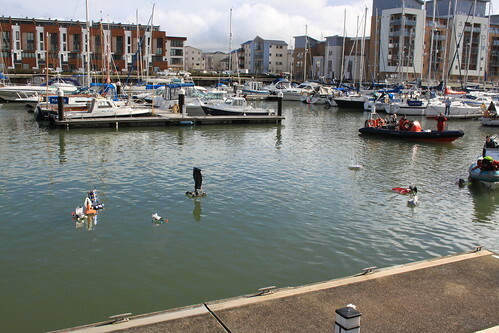 By this time, quite a crowd had developed around the marina, as local people and visitors alike struggled to get their heads around what was going on. The little guys admired the craftsmanship that had gone into the different entries. Plastic bottles seemed to be the main material used, but plastic bags, lager cans and vegetable cartons were also popular. We even saw what looked very much like a pirate ship, charging through the middle of the fleet as it made a desperate bid for victory. The wind proved to be a little fickle as the boats approached the finish line, with several getting caught up in a circular vortex that saw them heading back towards the start. And as any yachtsperson will know, all marinas have a corner where all of the flotsam and jetsam eventually washes up. 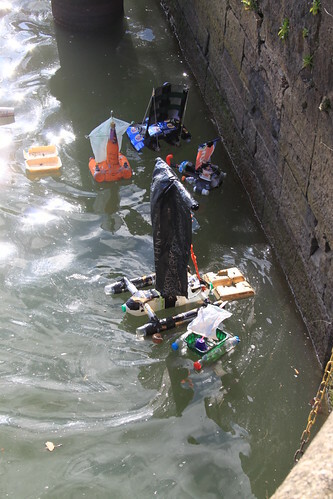 Portishead is no different, but thankfully the Compass team were on hand to retrieve the stricken craft and send then on their way. One by one, the boats finally started to trickle their way over the finish line in the approach to the lock gates. I think this one was the winner, but I may be entirely mistaken. 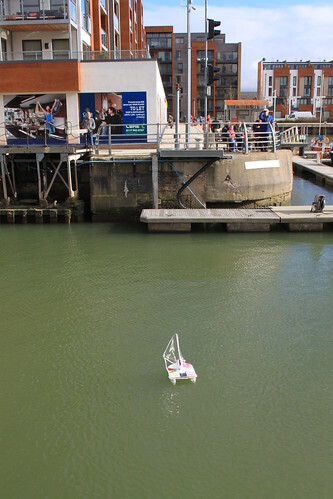 What I know with some certainty, though, is that the Crew were absolutely smitten with the race’s safety boat, which had been prepared by four-year-old Alfie. They were delighted to meet Alfie himself, as well as the boat’s very own LEGO crew. So all in all, a great afternoon on the water. 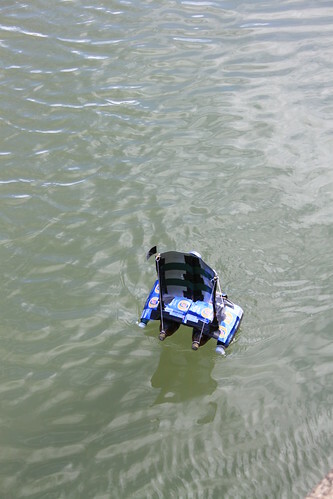 Boat building, racing, excitement, fun and frivolity. And all in aid of a fantastic cause. Who could wish for more? A great big ‘thank you’ to the Compass Sea School team for having such a great idea and for being kind enough to invite the Crew (and me, Natalie and Molly) along to enjoy it. 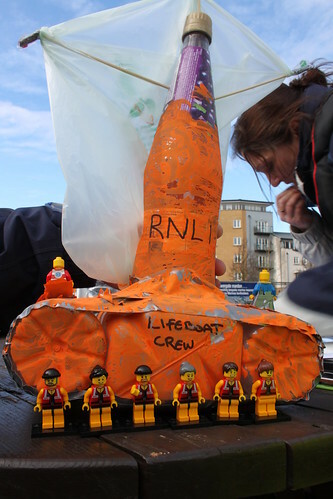 This entry was posted in Out and about and tagged Great Green Recyclable Regatta, Lifeboats, Portishead, RNLI, The Lifeboat Crew by Simon Perks. Bookmark the permalink.